This guide provides you with an overview of the key objects you'll use in the Programmable Video API to build your video application with the Twilio Programmable Video iOS SDK. Note: If you haven’t already done so, then take a look at the Twilio Video iOS QuickStart Application [Swift, Objective-C]. Once you've played with the QuickStart, come back to this guide for more detail on how to add video to your own app. To start using the iOS Programmable Video SDK in your apps, you need to perform a few basic tasks first. The TwilioVideo.framework is built with Xcode 9.4. The framework can successfully be consumed with previous versions of Xcode. However, re-compiling Bitcode when exporting for Ad Hoc or Enterprise distribution requires the use of Xcode 9.x. 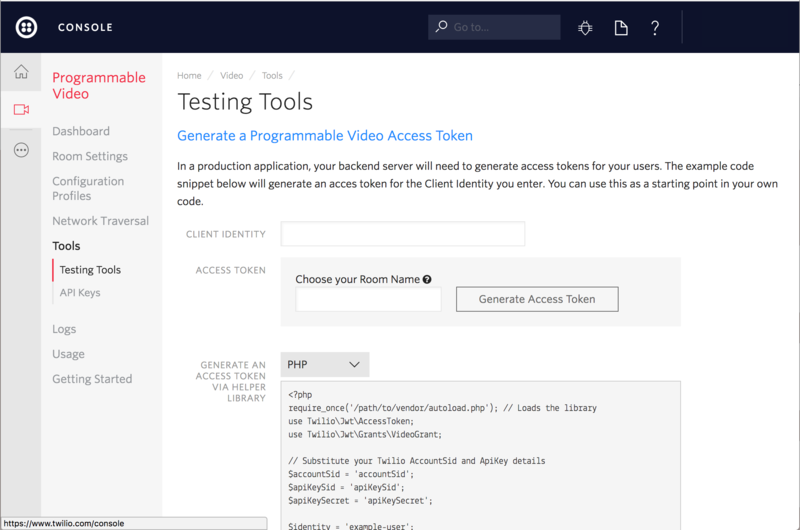 To execute the code samples below, you can use the Testing Tools page in the Twilio Console to generate an Access Token. An Access Token is a short-lived credential used to authenticate your client-side application to Twilio. Call TwilioVideo.connect() to connect to a Room from your iOS application. Once connected, you can send and receive audio and video streams with other Participants who are connected to the Room. Local audio, video or data tracks, to begin sharing pre-created local media with other Participants in the Room upon connecting. If you'd like to join a Room you know already exists, you handle that exactly the same way as creating a room: just pass the Room name to the connect method. Once in a Room, you'll receive a room:participantDidConnect: callback for each Participant that successfully joins. Querying the remoteParticipants getter will return any existing Participants who have already joined the Room. // Create a video track with the capturer. When the client joins a Room, the client can specify which Tracks they wish to share with other Participants. Imagine we want to share the audio and video Tracks we created earlier. When you join a Room, Participants may already be present. You can check for existing Participants in the roomDidConnect: callback by using the remoteParticipants getter. * Track by rendering it on screen. // Use TVICameraCapturer to produce video from the device's front camera. // TVIVideoView is a TVIVideoRenderer and can be added to any TVIVideoTrack. In a Peer-to-Peer Room, each Participant has media connections to all the other Participants in the Room. If all media connections between the LocalParticipant and all other Participants are broken, then the LocalParticipant's Room will enter the reconnecting state until media connectivity with at least one Participant is re-established. When connected to a Peer-to-Peer Room with no Remote Participants. When connected to a Peer-to-Peer Room with other Remote Participants and no shared audio tracks. When connected to a Group Room with no shared audio tracks.